Brand New!!! Check out the new fun, yellow rim bucket. 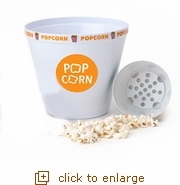 Our new color rimmed popcorn buckets are large enough for the whole family to enjoy! Each serving bucket holds approximately 6 quarts of popcorn. Bucket measures 9" across the top and is 8" tall. Coordinating individual sized buckets are also available for only $3.99!